Chillingo, the makers of hit iOS games like Cut The Rope and Fancy Pants Adventures, have just made their popular puzzle game Feed Me Oil free for today only. Both Feed Me Oil and Feed Me Oil HD (iPad Version) can be downloaded for free from the App Store today which normally sell at $0.99 and $1.99 respectively. 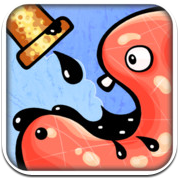 The theme of the game is to get the oil from the broken pipe to the mouths of the strange creatures using all sorts of fun tools, something similar to Where’s My Water iOS game. • Incredibly slick and realistic physics create oil like you’ve never seen.